He was the first once again on the evening of July 19, when the wail of the siren woke him from a catnap in his kitchen. At 85, Fred no longer had the strength and speed of a young man; it had been at least a dozen years since he could suit up to actively battle fires. But he could still pull on his boots, which were always waiting by the kitchen door; he could still reach the fire hall before anyone else; and he could still make sure the station bay doors were unlocked and the exits cleared so that as firefighters arrived, they could get the trucks and equipment moving without a moment's loss. As he reached the steps leading from his porch down to the driveway, he momentarily blacked out — a new medicine had been giving him vertigo — and fell heavily, face first, onto the pavement. The damage was massive. Fred lapsed into a coma as an ambulance, operated by first responders he'd known and worked with for years, rushed him to a helicopter so he could be airlifted to the Syracuse Medical Center. But there was no hope of saving him. He never recovered consciousness and died the next day. Fred Weller was my father-in-law. That infant daughter, the oldest of seven children, grew up to become my wife. She and I and hundreds of others said good-bye to Fred a few days ago, as friends and loved ones gathered in Alexandria Township to celebrate a life that was modest, hardworking, down-to-earth, and honest. It was lost on no one that his last purposeful act in this life had been an effort to serve others. At an age when some might be content to doze, he still regarded the fire whistle as a personal summons to act. My father-in-law earned his living as a school custodian and a handyman-for-hire. He shoveled snow, raked leaves, and cut lawns. He grew vast quantities of vegetables and fruit in a garden behind the house, and gathered fallen timber that could be cut and stacked for firewood. With little formal education and a large family to feed and clothe, he never turned up his nose at a job. And he taught his kids both by example and by instruction that hard work wasn't optional and thrift wasn't a choice. Yet in all his 61 years as a volunteer firefighter, he was never paid a penny. Again and again he answered the whistle, often risking his life to protect the lives and property of others. When he wasn't responding to emergencies, he was devoting hours to training and maintenance, to fire commission meetings, even, in the old, pre-automation days, to manually turning the siren on when alarms were phoned in. Not for a salary, or a bonus, or a pension, or glory — there were none — but from a commitment to service, and from a responsibility to a community that relied upon him. In my line of work, I normally can't get away from the perpetual-motion machine of political dissection and prediction, but the sweaty spectacles in Cleveland and Philadelphia seemed a million miles away from the gratitude and dignity with which my father-in-law was remembered. They seemed not merely distant, but trivial. I found myself thinking that Fred Weller's conscientious life and eloquent death had more to say about the essential goodness and integrity of American character at its simplest than all the high-flown speeches and promises by all the politicians in the presidential campaign circus. In a famous essay, Edmund Burke wrote long ago that "to love the little platoon we belong to in society is the first principle (the germ, as it were) of public affections. It is the first link in the series by which we proceed towards a love to our country and to mankind." What would American society and culture amount to without the institutions and relationships that make our communities work — without countless "little platoons" like the Plessis Volunteer Fire Department, and the innumerable other associations on which our national health depends? This country would survive — it would probably thrive — without the political poobahs and media mahatmas who consume such obscene amounts of oxygen. But it would sicken and die without a steady supply of women and men like my father-in-law, who take real pride in filling their days with diligence and useful service, and don't expect more. The big-screen razzmatazz for the presidential nominees was undeniably flashy. 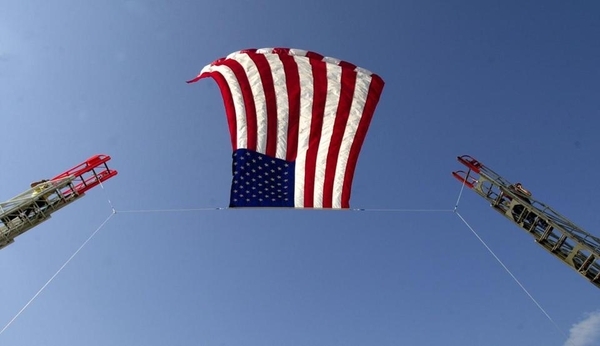 But it was nothing compared with the sight on Wednesday of a giant American flag, hoisted between two ladder trucks high above Church Street in Alexandria Bay, N.Y., where Fred Weller's memorial service took place. With mourners and firefighters lining the sidewalk in tribute, and with traffic stopped in both directions, the Jefferson County police, fire, and emergency dispatcher transmitted a "last call" over the staticky radio channel to which my father-in-law had never failed to respond. "Plessis firefighter Frederick Weller, last call," came the dispatcher's no-nonsense voice on the scanner, broadcast on this occasion over a public sound system. "This is the last call for firefighter and commissioner Frederick J. Weller. Until we meet again, old friend. We'll take it from here.